The Band﻿ Perry are an American country group and consists of Kimberly Perry, Reid Perry and Neil Perry. They signed to record label Republic Nashville (alongside Martina McBride) in August 2009 and have released four singles (Hip To My Heart in November 2009, If I Die Young in June 2010, You Lie in January 2011 and All Your Life in August 2011) and their self-titled debut album since then. Kimberly Perry is twenty-eight while Reid and Neil are twenty-three and twenty-one respectively. Kimberly originally had her own band as a teenager with her brothers working as roadies. When they were old enough Reid and Neil began playing as The Mobile Music Machines, an opening act for Kimberly. 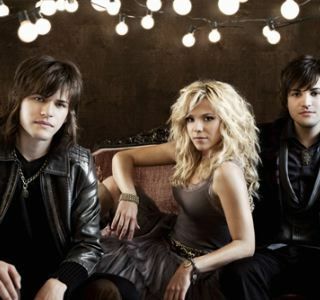 When they became The Band Perry they then joined the New Faces Of Country Tour in 2005. The band's self-titled debut album was released on 12th October 2010 and featured songs such as Independence and Hip To My Heart. All of the album is very strong and well developed. One of my favourite songs from the album is Independence. The song has a strong beat behind it and the lyrics tell a story that anyone can follow. The Band Perry sang an acoustic version of Independence at Oceanway Studios in Nashville last year which is really good. Another very strong song from the album is All Your Life. The song builds up nicely and then about halfway through it strips back for a few bars which is really effective. The messages behind all of the songs on The Band Perry's album are very clever and are varied enough to keep a listener interested. Perhaps the band's most well known song is If I Die Young which went triple platinum in the US. It is a beautiful song and was written by Kimberly Perry. The melody is beautifully soft and constrasts wonderfully from songs such as Hip To My Heart and All Your Life. The start of the song is beautifully arranged and simply has Kimberly's vocals and then guitar and fiddle supporting her. The song has a drum beat throughout a large part of it but it serves to add to the song rather than to make it into a more upbeat song. Kimberly Perry has a lovely soft voice reminisent of Mim Grey and a softer voiced Miranda Lambert. Her voice is very suited to acoustic songs but still also has the power to do justice to their more gutsy songs. Reid and Neil support Kimberly excellently and all three of the band are very skilled musicians. In next month's Country Music Association Awards The Band Perry have been nominated for five awards, equalling Taylor Swift's nominations. I would certainly like to see The Band Perry walk away with a few awards and I think they stand a good chance in New Artist Of The Year, Single Of The Year, Song Of The Year and Music Video Of The Year however I think they may stuggle to win Vocal Group Of The Year as they are up against Lady Antebellum, Little Big Town, Rascal Flatts and Zac Brown Band, all of which are very strong bands and have had good years. The Band Perry have won awards in the past such as Top New Artist and Top New Vocal Duo or Grup from The Academy Of Country Music Awards in 2010. The Band Perry are also not afraid to cover songs. In many of their concerts they have covered songs as different as Tom Petty's Free Fallin' and Don McLean's American Pie to much applause from the audience. I am new to the music of The Band Perry and I can happily say I love the album. I haven't been able to see them live but you can tell from videos of their various performances that they have a great time on stage. I hope to see them in the UK soon! Five stars! --> The CMA awards return on November 9th with the nominations announced on the CMA website. --> Sugarland return to Indianapolis tonight to perform a benefit concert for the Indiana State Fair Remembrance Fund. Fans have been queueing since 5am Indianapolis time for the show to honour the victims of the Sugarland stage collapse at their Indiana State Fair concert in August. --> Lionel Richie is to release a country duets album. The album - titled Tuskegee - will feature 13 of his most famous songs re-recorded as duets with country artists. Some of the artists featured are Jennifer Nettles of Sugarland, Shania Twain and Kenny Rogers. --> Justin Bieber has teamed up with The Band Perry to release a Christmas song entitled Home This Christmas.